Resurfacing asphalt is an option to fix damaged or worn down pavement that doesn’t necessarily need replacement. It may seem like a durable, nearly indestructible surface, but eventually even asphalt needs resurfacing. Over a certain period of time, it can be damaged due to exposure to Austin weather, weight of vehicles and spillage of vehicle fluids onto the surface. If you put off repairing the damage, it can get worse in a hurry. Fluids can puddle in depressions in the asphalt, which weakens the surface. Water and other liquids can seep into cracks in the asphalt, further weakening it and leading to even more damage. Having an asphalt overlay applied – also known as resurfacing – is an excellent choice for surfaces that aren’t severely damaged. In resurfacing, a new layer of asphalt is applied over the original surface. This overlay is particularly appropriate if the original surface is somewhat damaged but the sub-grade is still in fairly good condition. Prior to the resurfacing being done, our paving experts will cut out and patch any damaged areas of asphalt. We’ll also level depressions and apply a primer, which adheres the new asphalt to the existing surface. Asphalt resurfacing is a great choice to make old asphalt look like new again. And it’s less costly that having a completely new surface laid. Asphalt resurfacing in Austin is not recommended for a surface that is badly damaged – one that is crumbling, has multiple large cracks or major sunken areas. The asphalt overlay will sink into any depressed or damaged spots, and the result will be an uneven surface that will eventually have exactly the same type of damage in the same areas as the original surface. Ask our trained professionals to assess your surface before making a decision whether or not asphalt resurfacing is the right choice. You can trust our experienced staff to provide you with an honest assessment, each and every time. And we’ll keep your budget in mind too! When it Comes to Resurfacing, Experience Counts! Asphalt resurfacing in Austin is a service in which the paving specialists at Bennett’s have many years of combined experience. We understand which repairs will work and which won’t work for different situations. If your surface is repairable, you can depend on us to recommend the best repair option – one that will last for years to come. On the other hand, if your asphalt surface is too badly damaged to be repaired, we’ll tell you that as well. Either way, you can rely on our trained staff to provide the most efficient, cost-effective solution to your situation. When you need an asphalt paving or resurfacing job done in Austin TX, it’s important that your contractor use only the finest materials available. Some companies may try to cut corners by using lesser-grade materials. But you’ll never have to worry about quality when you choose Bennett Paving. We use only the highest quality materials available to ensure that your asphalt overlay lasts for years to come. And we’ll do the job at an affordable price! 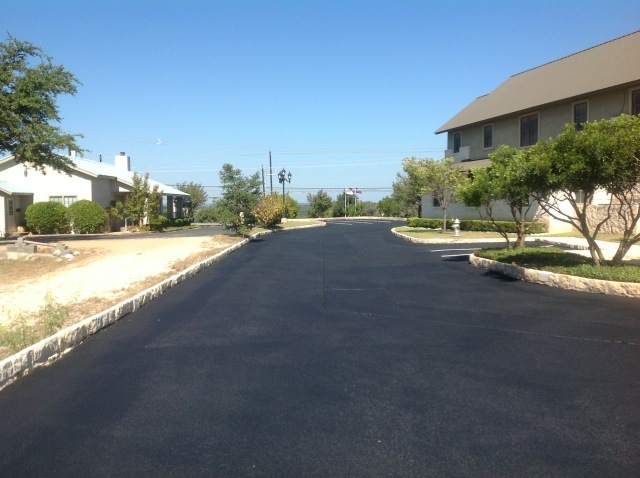 Call us today to get a free estimate for asphalt resurfacing in Austin.